Sedanos Supermarket has been a part of South Florida life for many years. Unfortunately on occasion, people get hurt at Sedanos Supermarkets due to the negligence or carelessness of others. Some people are injured because of intentional actions of ill-intentioned individuals. In order to determine responsibility and accountability an investigation is necessary. It is respectfully suggested that if you were injured in a Sedanos Supermarket, then you should consult with a Sedanos Supermarket accident and injury lawyer at your earliest convenience. It is not only important for you but your family to make a solid determination of who is responsible for your injuries. It’s one thing if it was a simple accident or your fault. But it is an entirely different matter if some other person or a corporation like Sedanos Supermarket is responsible. The cost of your medical bills, rehabilitation, lost wages in the past and in the future, not to mention your pain and suffering must be addressed. If someone through their carelessness or negligence caused your accident and injuries, then you should speak with a Sedanos Supermarket accident attorney as soon as possible. You can call the Miami personal injury lawyers at the Wolfson Law Firm right now at (305) 285-1115 to speak with a member of our bilingual personal injury legal team. 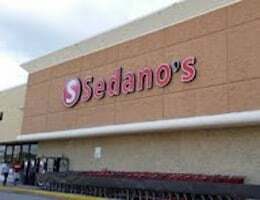 Founded by Rene Sedano in 1961, the first Sedanos market was a four thousand square foot store in Hialeah, Florida. It was later sold to one Armando Guerra Sr. because of Rene Sedanos desire to head back to his home in Cuba. However, Armando kept the name “Sedanos” building several supermarkets, adding discount pharmacy stores later on. Mr. Guerra Sr. would pass away in 1979, having Manuel Herran to take over, he would lead the expansion of the business by bringing in much of his family to work in the company. It now includes more than 30 stores in the Miami-Dade area, as well as Broward, Palm Beach, Orange, and Osceola in Florida. Here at the Wolfson Law Firm, we work with our clients so that they are knowledgeable and informed about their case and the law. In our experience, the more a client knows the better it is for everyone. We understand that it is your case. You are the client. You decide whether to make a claim or not. It is your decision whether to file a lawsuit are not. Ultimately it will be your choice of whether to accept a settlement offer or to proceed to a jury trial. Since 1963, our Miami personal injury lawyers have advocated and guided victims injured in all types of injury cases. At the Wolfson Law Firm, our Miami wrongful death lawyers have helped the survivors and families of those unfortunately killed due to the negligence or intentional acts of a responsible third-party. Our lawyers and staff all understand that your loss, injury and damages are likely to be the only time in your life that you experienced anything like the accident that you endured. We are committed to aggressively representing you and your interests. As we work towards a full, fair, and complete resolution of your case we are mindful of how long the process can take. When you have been injured or lost someone close to you, the period of time it takes to get your case resolved can seem unreasonably long and burdensome. We understand. That is why we employ strategies to reduce the amount of time that any particular case is open and pending. These strategies include a reasonable but strict deadline for all settlement demands before litigation. Once a case is in litigation, we seek assistance from the court to bring a case to mediation and a jury trial if necessary. Our Miami personal injury attorneys offer full personal injury legal representation to all of South Florida including the towns and neighborhoods of Hialeah, Homestead, Doral, Aventura, Tamiami, Westchester, South Miami, Miramar, Hollywood, Pembroke Pines, Miami Lakes, Fontainebleau, West Miami, Kendall, Hialeah Gardens and Miami Beach. Call us today for your free and confidential consultation concerning your Sedanos Supermarket accident and injury at (305)285-1115. Let us get to work for you right away.